The Piranha Ironworker P-50 is a solid ironworker with great value. 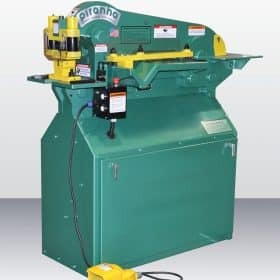 Piranha’s standard features like a low rake angle notcher and clear line of sight in the work area allow for clean notching and coping on angle iron in one stroke. All Ironworkers include electronic stroke control and integrated coper and notchers, along with other features that vary according to model. 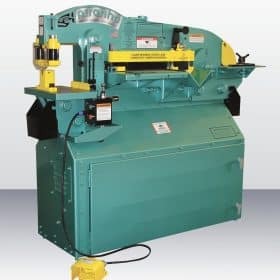 The P-65 Piranha Ironworker unique automatic urethane hold downs eliminate time spent on adjustments during shear cuts, they also effectively keep flat stock and sheet metal from distorting during operation. Faster cycle times and less distortion mean value added benefits. These standard features save metal fabricators time and money, bringing value to every fab shop. The P-90 Piranha Ironworker dovetail slide allows steel fabricators to switch from punching to bending, easily and efficiently. Metalworking machine shops everywhere have come to appreciate Piranha’s Quick-Change Tooling. Likewise, the urethane strippers almost eliminate part distortion, while minimizing stroke length. These standard features, plus more horsepower per ton, is why Piranha Ironworker machines lead the competition. The P-110 Piranha Ironworker is incomparable in value and benefit to metal fabricators and metalworking shops. With a 110 tons of punching, bending and notching force this Piranha Ironworker will boost shop productivity. The Piranha Ironworker brand has earned the respect of metal fabricators across the nation; FABTECH SOLUTIONS is a trusted dealer and proud to carry Piranha’s line of ironworkers. 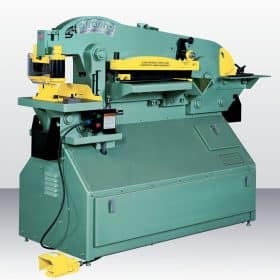 The P-140 Piranha Ironworker is the top of it’s class. 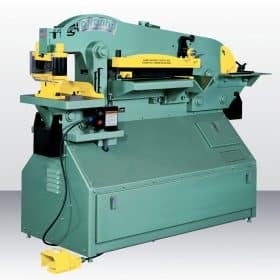 It can perform all the functions commonly expected from ironworkers; bending, punching, notching, and far more. This Ironworker’s versatility will boost shop productivity by allowing for a large number of tasks to be finished quickly and easily. The Model Number, indicates the punch capacity as measured in tons. 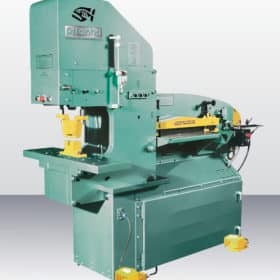 The Dual Operator Piranha PII-88 allows for simultaneous operation of the punch station and shear/coper-notcher stations. 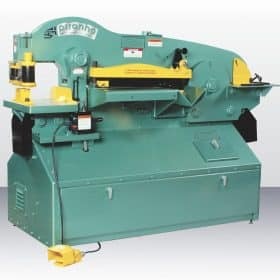 This ironworker will double your production capacity with dual operation and plenty of advanced features, like the Automatic Urethane Hold Down on the Plate and Angle Shear. The Dual Operator Piranha PII-140 allows for simultaneous operation of the punch station and shear/coper-notcher stations. 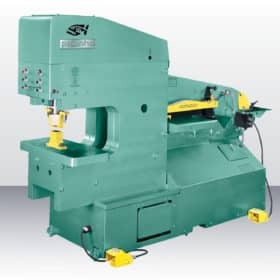 One of the most powerful ironworkers on the market, providing enough punching force for any application and with dual operators, it’s also one of the most productive.